Raspberry Pi enthusiasts that enjoy building IoT projects using the Pi PC might be interested in a new Raspberry Pi HAT that has been specifically created for the Internet of Things and the Raspberry Pi range of mini PCs. The new Pi HAT offers a number of wireless features and is equipped with Wi-Fi 802.11n and Bluetooth 4.1 Dual Mode support and can also be added to any Raspberry Pi mini PC model thanks to the inclusion of the 40 pins GPIO connector. 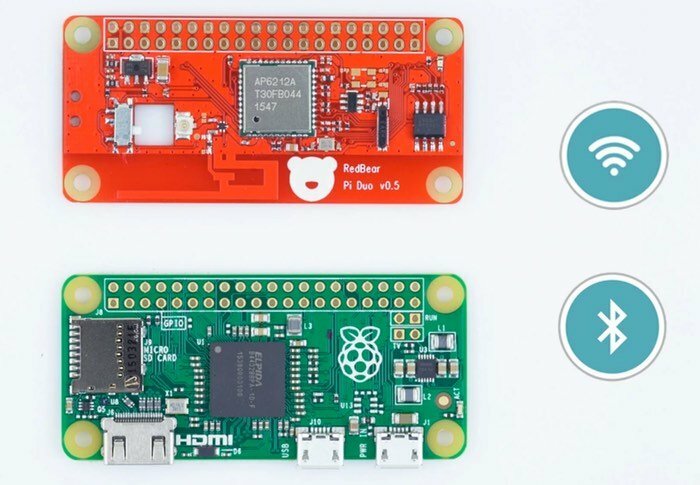 Watch the video below to learn more about the features that the IoT HAT for Raspberry Pi amount to your projects by simply connecting it using the GPIO connection. RedBear the Raspberry Pi boards developers based in San Francisco California explain a little more about the inspiration, features and design of the Raspberry Pi IoT HAT. – USB OTG cable ($3-$5) – connect a normal USB device to the Pi Zero’s micro USB port. – USB hub with power adapter ($15-$30) – if you need to connect more than one USB device, it is advisable to use a powered hub for your Wi-Fi and/or USB Bluetooth dongle(s). We are using the same BCM43438 chip that is on the Pi 3 (read here) which supports both Wi-Fi 802.11n (2.4GHz) + Bluetooth 4.1 (Dual Mode – Classic and Bluetooth Low Energy) running at the same time.They are the most frequently used wireless technologies; we use them to access the internet, connect cordless keyboards and many more. However, Pi Zero and previous Raspberry Pi models do not have Wi-Fi and Bluetooth built-in. For more information on the new IoT HAT for Raspberry Pi jump over to the Kickstarter website for details and to make a pledge from $9 following the link below. If you found this article interesting you might also be interested in this list of awesome Raspberry Pi Zero projects we have put together.